This is the second of in a series of posts about James Cameron's new film Avatar. As Luke Skywalker might say, finding fault with the science in science fiction films is about as challenging as bull's-eying womp rats from a T-16 back on Tatooine. Yes, every now and then a science fiction film takes as a central premise an intriguing theory and expands upon it using plausible extrapolations of current technology and scientific knowledge. 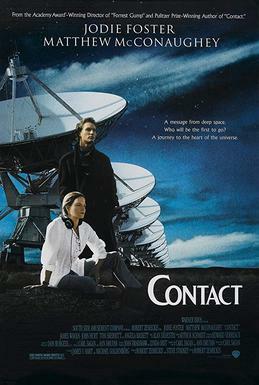 The movie Contact (1997) and its treatment of the search for and discovery of intelligent extraterrestrial life shines in this regard. More often, the science of a science fiction film serves as a device used to transport a conventional story to a dramatically different setting, where, stripped of the distractions of our everyday world, its themes can be amplified and so stand out in starker relief. This kind of borrowing is as old as the visionary 1927 silent science fiction masterwork Metropolis and its "scenes from the class struggle", set in a near-future urban dystopia. It would be fair to say that Avatar falls squarely, and respectably, into this second category. Its narrative is so similar to Kevin Costner's 1990 Academy-Award winning film, that I began to refer to it as "Dances with Avatars" after only seeing the theatrical trailer. Director James Cameron re-situates this story of the American West, itself many times retold, to the Eden-like world of Pandora, where the encounter of a rapacious, imperialistic human culture with a noble indigenous people, living in harmony with their ecosystem, unfolds, in part, as a work of contemporary political commentary and, in part as cautionary environmental tale. Science enters the picture, so to speak, in several ways. Cameron has gone to some length in the early scenes to fashion a realistic spacecraft to be used to transport his human characters to Pandora, a moon orbiting a Jupiter-like gas giant planet of a presumably nearby star. The passengers, themselves, have been placed into some sort of cryogenic sleep, the better to endure the apparently lengthy voyage. Echoes of the technologies of 2001: A Space Odyssey (1968) are quite vivid here, and they remind us how diligently Stanley Kubrick labored - 40 years ago - to imagine realistic long-duration space travel. It makes the scientifically-minded among us wistful for the days before the invention of warp drive. 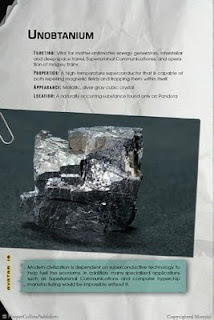 The Macguffin that drives the human plunder of Pandora is a mineral named - in the best self-mocking science fiction tradition - unobtanium. 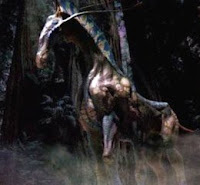 We are told little about other than that it is extraordinarily valuable, and that its mother lode lies directly beneath the arboreal habitat that is the hub of the community of the tall, blue-skinned, anthropoid natives called the Na'vi. 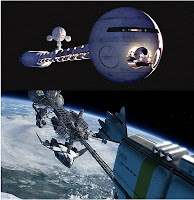 Although it would be hardly sensible to send a ship into deep space to obtain a "precious" resource that - given the technological advances that would make such a mission feasible - could be manufactured much more cost-effectively here on planet earth, this plot device has become such a fixture of the science fiction canon that it was long ago exempted from being considered a threat to the suspension of disbelief. Oddly enough, Avatar's significance not only as a science fiction film but as a science film has little to do with technological gimmicks, like interstellar travel and a rare superconducting mineral, and everything to do with the unprecedented detail with which Cameron has crafted the biology - both flora and fauna - of the hypothetical world which serves as the setting for his film. Unfortunately, the scientists of Avatar - exoanthropologists, one might call them - are consigned to secondary roles. What a difference it would have made had James Cameron seized the opportunity - in the very year that marked the 200th anniversary of Charles Darwin's birth and the 150th anniversary of the publication of his On the Origin of Species - to position a scientist-explorer, and not a disillusioned imperial soldier, front and center as the hero of his movie. With more artistic daring this recycled tale of thwarted neocolonial conquest could have been replaced by a bold re-imagining of Darwin's Voyage of the Beagle. Avatar could have taken its place as not only a technical tour de force of film production but also, by making a scientific adventure the center of its story, a work of science fiction of the highest order. * Depiction of the naked human form, I imagine, is even less welcome in Georgia classrooms than the notion that we, as a species, are descended from apes. "Avatar" - Nature Blue in Tooth and Claw by Marc Merlin is licensed under a Creative Commons Attribution-Noncommercial-No Derivative Works 3.0 United States License. Your talk of Darwin's birth suddenly made me notice something: What is the significance of the year 2154 in the film? I then guessed that it must be the 200th anniversary of Cameron's birth, and an internet check confirmed my hunch. I agree that it would have been great if Cameron had made the movie into a scientific expedition to Pandora, comparable with Darwin's voyage; however, it is difficult to see how one could get a billion dollar grossing film out of it then. Every good tale needs tension, and high-grossing movies probably also need a love story thrown in. Where would the tension come from in a scientific expedition to Pandora? Perhaps something along the lines of the movie Contact, or maybe The Right Stuff, could have worked. Thanks for pointing out the significance of Cameron's selecting the year 2154 for the setting of "Avatar". I didn't think to check that it might be the 200th anniversary of the year of his birth since I was preoccupied with the fact that it also happens to be the 200th anniversary of the year of my birth. It appears that James is only about 4 months older than me. I agree, there's no way a high budget Hollywood movie could be made without a love story and at least a battle scene or two, but I think these could we woven quite efficiently into an alternative "Avatar" narrative based on a scientific expedition to Pandora. 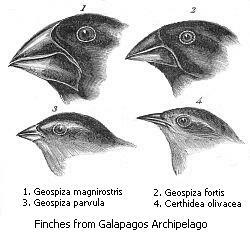 The kernel of this idea is present in Cameron's film with the scientific team led by Sigourney Weaver. It's interesting to imagine variations of their story that could lead to the requisite romance and conflict demanded of a mass-market movie.